OMG YESSS these easy little concoctions were a household favorite tonight! ... So much so that my husband actually devoured all 3 showed in this photo before asking me if I had any.... he "thought I already had some" ha ha! With these tasty stuffed sweet potatoes, you're getting a megadose of phytonutrients, fiber, beta carotene, vitamins and minerals. I subscribe to the ALL FOODS FIT methodology and I encourage if you want something HAVE IT! SO if you want to add in some ground turkey or shredded chicken to this meal, that would be delicious too!! =) If you want to add a sprinkle of cheese and your body (not your habitual behavior) tells you.. yes I want some cheese - then do it! Reminder here that NO foods are good or bad (some may just have a different nutrition profile) and we have to get back to what our body feels like it truly needs and feels best on!! And for the record, we ALL have different needs! When we change this paradigm shift of thinking, we enjoy our foods, we eat until we are satisfied, and we don't feel guilty about foods we eat. While this is a higher carb meal, it is amazing for a post-workout meal (for those of you working out in the evening and having dinner soon after, this would be perfect!! Dig in and SAVOR your food today!! Pop sweet potatoes 🍠 (sliced down the center, leave face up) in oven for 30 min @ 350-400F on baking pan. Meanwhile, cook quinoa on stovetop (or for me I just used up last nights extra batch). Add to your cooked quinoa: black beans, several dollops of salsa (and any hot sauce), cilantro, chopped tomatoes 🍅 , avocado 🥑 and squeeze of lime... add sprinkle of hemp seeds for extra protein/fiber. Season w salt/pepper. Optional to add cheese and put in oven for another 10 minutes. .
Roasted Brussel Sprouts in a Vinegar-Dijon dressing. I love adding some dried cranberries to the mix to make it an extra festive dish around the holidays! Get the full recipe! Fall is here and so are all of the root vegetables in season! Cinnamon Roasted Butternut Squash is great as a side... but now just add those leftovers to your green salad for a warm and fully flavorful and delicious meal. Get the recipe! Sounds fancy, looks beautiful... actually SO easy and only takes about 5 Ingredients! The key to it? Well, if you've ever come to any of my cooking demonstrations in the Cincinnati area you would know the trick!! It is to MASSAGE YOUR KALE - yup! Everyone always get's a kick out of it but it's totally the truth and it's the game changer to an amazing kale salad (one that I PROMISE you will love!!). Get the recipe!! YUM this easy peasy side dish is SO tasty and really takes those basic roasted vegetables to a whole new level! Meet the perfect combo of sweet, salty, starchy, with a perfect balance of acidity from fresh lemon. These easy marinated cherry tomatoes are bursting with flavor, so easy to prepare, and perfect for hydrating your skin and cells on a hot summer evening. Whip up this 5 min cherry tomato salad, perfect addition over fresh fish, on the side with a meat/fish, or even just tossed with some chickpeas, quinoa, or spinach for a meal. This is one of our favorite vegetarian dishes at home because it's so full of flavor and it's really just a ton of fiber rich veggies along with plant-based protein! This is a staple in our household because I can use these sweet and tasty treats all week long in multiple dishes! Complex carbohydrates are excellent for long lasting fuel - whether you are looking to manage hormones, sustain long workouts, or fuel for your day to prevent hunger pangs in 1 hr of eating - fuel up with some hearty sweets & beets! This incredible Cranberry Hazelnut Chutney is SUPER tasty, perfect amount of sweetness from the fruit and maple syrup, a bit of zing from the tangerines/lime, tartness from fresh cranberries and I love the texture and crunch from the combination of different fruits and toasted hazelnuts. Use in yogurt, with chicken, on whole grain toast, with eggs in the morning, and even just as is for a mini snack. Love this recipe and I know you will too!! It’s a great source of fiber and protein due to the quinoa and lentils, but it’s also got some bioflavonoids from the parsley and a natural sweetness and antimicrobial properties from the sautéed onion, garlic and mushroom mix. I do love my spice, and adding in a bit of hot sauce and cumin adds the touch that you need. These patties hold together well and worked great on the skillet to bake until crispy - oh la la so delicious and nutritious! Why is this in the snack section? I want to encourage you to eat whole foods and not just the typical "snack-y" things that come in the form of bars, dips, and bite-sized pieces. Try using leftovers or in this case, have 1/4 cup of my apple spiced quinoa to get you started! This is a meal you can batch make in just 10 minutes but will last you throughout the week for BREAKFAST, LUNCH, SNACKS, and DINNER? Welcome to the world where meal prep does not have to be difficult, it's just how you prepare and set yourself up for success! Get a large stockpot of boiled on the stove and cook your quinoa in 12 minutes and your ready to add in all the ingredients for a week long amount of snacks and meals. Quinoa is a superfood too, it's a plant-based protein (great for vegans and vegetarians), but is also a gluten-free, wheat-free grain (good for those on elimination diets, on the paleo diet, or on testing out a wheat-free/gluten-free dietary protocol to test for any intolerances or allergies. SERVE: Quinoa can be served hot off the stove or cold as is. Snack: Serve as is with a spoon or dip with apple slices. Breakfast: Serve warm on the stove top. Add a little almond milk to make a warm porridge for cold fall mornings. Lunch: Serve as is or over a large bed of leafy greens for a salad. 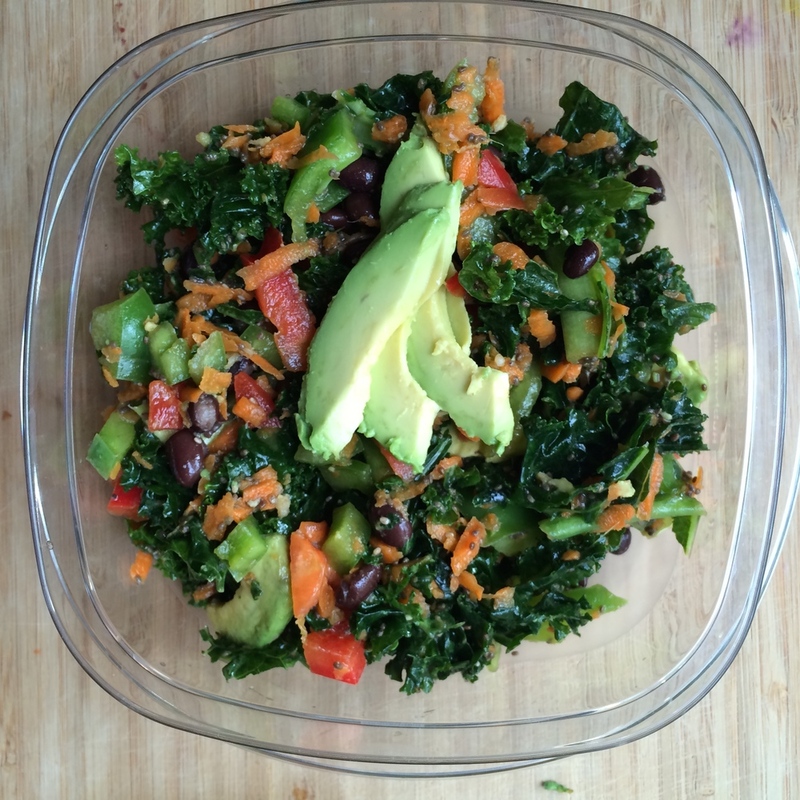 Dinner: Use this mix to stuff a sweet potato! Just cook your sweet potato in the oven whole at 350F for 30-45 minutes, then open it up scoop out a small circle and put the quinoa in the center. Checkout my recipe for stuffed sweet potatoes. Everyone loves a super hero.. they swoop in and save the day right?! Well that's exactly what this Kale Salad will do for you! I make kale salads like I would a stir-fry... I think of it like my garbage can and just add whatever is left from my produce to the bowl. Surprisingly it usually comes out pretty good.... and that's because I know a BIG SECRET that I will share with you here! Secret: MASSAGE YOUR KALE with a drizzle of olive oil and sea salt before adding any other ingredients to the bowl. This allows the fibrous leaves of kale to break down, making it easier for you to chew, enjoy, and digest. First wash all ingredients and wash your hands well. Then, massage Kale as indicated above. Drizzle olive oil and sea salt over the kale and use your hands to squeeze and scrunch the kale leaves between your fingers. Then add all ingredients to the bowl and mix thoroughly.